Shopping for Star Trek Computer Accessories? 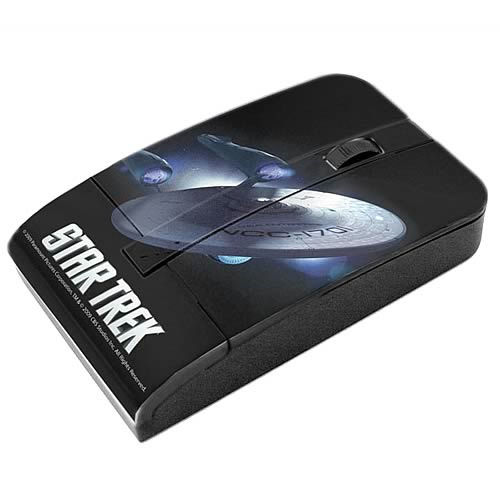 The Star Trek Movie Enterprise Mouse brings new levels of fun to your desktop! Useful wired mouse includes two buttons and a scroll wheel! From the final frontier to your desktop, Keyscaper Mice are exciting and easy to use! Just plug them into your USB plug and insert the included "AAA" battery and you're off! Keyscaper Mice feature your favorite characters and will show everyone in your workplace what you are most passionate about! The images on Keyscaper Mice are printed directly onto the product so it is high quality and very durable! Featuring graphics of the U.S.S. Enterprise from the hit 2009 movie, this wired device is compatible with PC and Mac. Measures about 3 3/4-inches tall x 2 3/4-inches wide.